SmartAction, a provider of Artificial Intelligence voice self-service, announced today that TMC, a global, integrated media company, has granted its Intelligent Voice Automation (IVA™) technology with a 2014 Speech Technology Excellence Award. This tenth-annual Speech Technology Excellence Award, presented by CUSTOMER Magazine, honors companies who have demonstrated innovation in speech technology solutions that improve the bottom line for their customers. SmartAction’s IVA solution is being recognized for helping businesses deliver faster, more accurate self-service in their call centers. The IVA technology is different from traditional voice automation, and is based on a proprietary artificial intelligence engine that constantly learns and improves as it interacts with callers, enabling it to engage in more human-like conversations, which creates a more pleasant and efficient customer service experience. “SmartAction has demonstrated to the editors of CUSTOMER magazine that its product is both innovative and a leader in the speech technology industry. Its IVA solution has proven its superior capabilities and has ultimately improved the bottom line for its customers,” said Rich Tehrani, CEO, TMC. 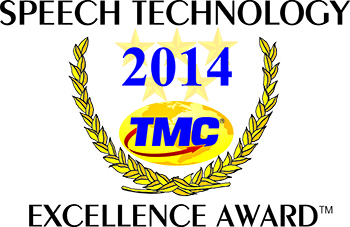 The Speech Technology Excellence Awards will be published in the 2014 October issue of Customer Magazine. SmartAction offers one-of-a-kind Artificial Intelligence (AI) voice self-service for medium to large businesses. We use a cloud-based technology grounded in purpose-driven Artificial Intelligence that utilizes Natural Language speech capabilities as a means to complete self-service calls. Commonly used for providing customer service, our Intelligent Voice Automation technology allows companies to handle complex customer interactions with an intuitive, resourceful, and cognizant AI agent. Learn more at http://www.smartaction.ai or call 888-882-9520.